Roscommon manager Anthony Cunningham believes there are "tough days" ahead for his side despite the promising signs in winning the Connacht League on Sunday. Cunningham’s side recorded a 0-13 to 1-05 success over Galway in Tuam ahead of next week’s first league game with Mayo. Cunnongham told RTÉ Sport: "It's pre-season for us. We're just delighted to get the matches every week. Coming down here was a big test for us. "We're developing and learning all the time. Our preparation is over now and a week ahead to Castlebar next Saturday night. "We would have said over the last couple of weeks that it's how much the lads learn from Division 1 football. That is the big question. "They have learned from Galway today. They are a cute team and a very experienced team. Every day we go out is a learning day. It's good for the guys. It's great for confidence. "Every day you're involved in sport is a plus. To be involved with players that want to get better is very satisfying but there are really tough days ahead of us. We'll turn up anyway." 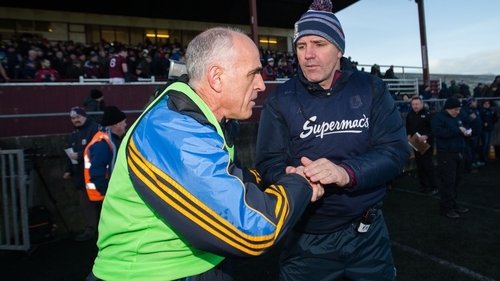 Yesterday’s Ard Chomhairle decision to abandon the handpass rule was factored into the game in Galway. While the handpass rule has been scrapped, the four other rules trialled during pre-season - the offensive/defensive mark, the 20m kickout, the mandatory forward sideline kick outside the 13m and the sin bin - will apply during the 2019 Allianz League. Cunningham would like to see the rules get a chance now. "The rules left it should be left in for the next while and give them their time. "The handpass rule was difficult because you would lose a good few scores. It's onwards and upwards for the game I hope. The guys are there to administer and try rules I suppose."